25@365: Day 046 - What if no one's watching? 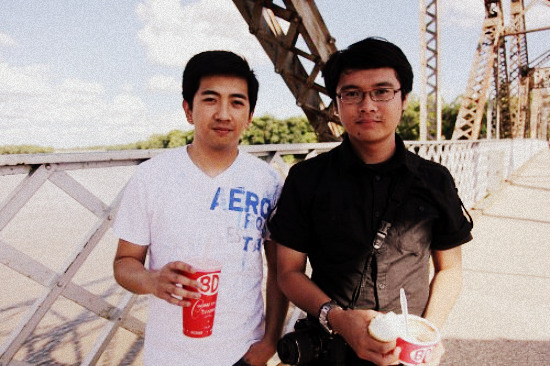 JULY 18, 2010 – Kelvin and I had our first decent photos made on Sunday. Thanks to Aris! I’ll be posting them here later once I get the permission to do so. 🙂 For now, here’s a snapshot of Kelvin and Aris while we were on the bridge. Anyway after that shoot, we picked up Cielo and Sybil and headed to BDI for some ice cream and of course, showing Kelvin around the city. We ended up chilling at our backyard because the weather became nice (unlike last Saturday). APRIL 7, 2011 - Done mounting the photos! I kept the white border for that raw effect.